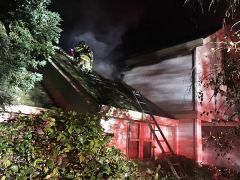 Shortly before 3:00 am on December 25th, Metro Fire crews were dispatched to the 5000 block of Walnut Avenue in North Highlands for a report of flames coming from the roof and rear window of a vacant house. First arriving crews reported a working fire and immediately initiated fire attack. The fire, which had started on the outside of the boarded-up house, had quickly spread inside. Firefighters forced entry and extinguished the fire, deploying multiple hoselines to different areas of the house to quickly contain the fire. The roof and attic sustained significant fire damage, with total damage estimated at $75,000. No injuries to civilians or firefighters were reported and the cause of the fire is currently under investigation. 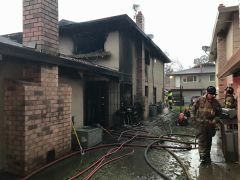 Firefighters were on scene less than five minutes after being dispatched, and the fire was already well-involved and had spread from the exterior to the attic and living quarters. Fire doubles in size every minute… if you see smoke, call 9-1-1 early! 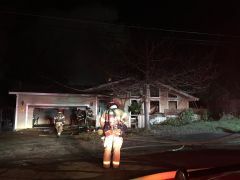 Just after 8:30 on November 18, Metro Fire crews were dispatched to the 9200 block of Lostwood Lane in Orangevale for a report of visible flames from the roof of a house. First arriving crews reported a working fire and immediately initiated fire attack. Firefighters located the fire, which had started in the chimney and spread to the attic, and extinguished it, while searching for victims, and ventilating the structure. While first-in crews were putting out the fire, other firefighters focused on protecting the residents’ belongings. Their efforts allowed the fire damage to be limited to the chimney, attic and a wall, while saving all of the family’s possessions. Two adults and two children were displaced by the fire. Total damage is estimated at $60,000; no injuries to civilians or firefighters were reported. As we enter the cold season, make sure your chimney gets inspected and cleaned every year by a professional. When using your fireplace, put the fire out before you go to sleep or leave home, and always put ashes in a metal container with a lid, outside, at least 3 feet from your home. For more information, check out www.metrofire.ca.gov, and follow us on Facebook and Twitter. Just after midnight on November 21, Metro Fire crews were dispatched to a home in Fair Oaks for a report of an overdose. When firefighters and Sheriff’s officers arrived, the patient was no longer there. They attempted to locate her, but were unable to. After searching nearby streets, the officers pinged her cell phone, which showed it to be on the north side of the American River, near Hazel Avenue. Officers then requested the help of a California Highway Patrol helicopter, who used infrared technology to locate the woman, lying on a ledge above the river, in slippery terrain. As fire crews were en route to the new location, one of the officers climbed down the slope to make sure the woman didn’t fall off the ledge. The victim, a 46-year-old female, appeared to have rolled nearly 70 feet before stopping on a ledge a few feet above the water line. She had a decreased level of consciousness, not responding to verbal communication. Metro Fire’s Rescue Task Force, with assistance from Folsom Fire, set up for a low angle rescue, using a second ambulance as the anchor. Once the rope system was in place, two rescuers were lowered to the ledge, where they quickly assessed her injuries and placed her in a rescue stretcher, so she could be safely hauled up the slope. The patient was then transported code 3 to a local trauma center. “This rescue, with all its unique aspects, demonstrates how our public safety agencies work together to benefit the community,” stated Metro Fire Battalion Chief Mark Repetto. 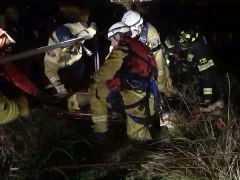 “Sheriff’s officers went above and beyond, CHP jumped in to help find the patient, and firefighters from multiple agencies rescued, treated and transported her. Without this collaboration, it’s not likely this woman would have survived through the night. The Sacramento Metropolitan Fire District Board of Directors will conduct a swearing-in ceremony at its regular meeting tonight for new Fire Chief Todd Harms. 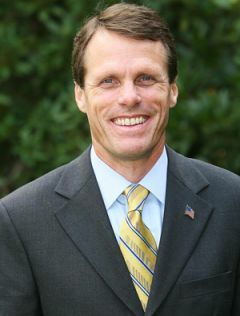 Following a national search, Harms was selected by the Board of Directors in August as the District’s sixth Fire Chief. He replaces Mark Wells, who, after 29 years of service in public safety and two years as Fire Chief, is retiring. Harms has 35 years of public safety service and most recently spent nine years as an Executive Staff member for the Phoenix Fire Department. He served as Assistant Chief of Operations, Assistant Chief of Personnel and the Training Division, with oversight of the Training Academy, Command Training Center, Special Operations, Emergency Medical Services, Technical Services, dispatch and the Regional 9-1-1 services. Harms began his fire service career in 1981 as a Firefighter Paramedic in Peotone, Illinois. In 1987, he became a member of the Phoenix Fire Department. While there, he progressed through the ranks as a Firefighter, Paramedic, Engineer, Captain, Battalion Chief, Deputy Chief of Special Operations and Shift Commander. He also has been an Urban Search and Rescue team member, with deployments to Hurricanes Katrina and Rita. Harms holds a Bachelor's degree in Fire Service Management and is a past adjunct instructor at Phoenix College in the Fire Science Program. Chief Wells started his fire service career with the Citrus Heights Fire District in 1987, and progressed through the ranks of Firefighter, Captain, Battalion Chief, Assistant Chief, Deputy Chief of Administration, becoming Fire Chief in 2014. 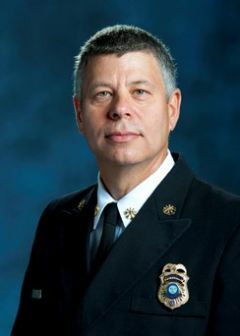 Key accomplishments during Wells’ tenure as Fire Chief include the successful negotiation of a new labor contract, the reopening of three closed fire companies, the implementation of a Joint Arson/Bomb Task Force with Sacramento County Sheriff, the development of a Residential Care Facility Inspection program, equipping all Metro Fire medic units with video laryngoscopes, power gurney systems and automatic chest compression devices, and the donation of two surplus medic units and one fire engine to local community colleges. Just after 6:00am on November 5th, Metro Fire crews were dispatched to an apartment complex on the 3300 block of Edison Ave in the Arden area. First arriving crews reported fire coming from the upstairs unit of a 4-unit complex and immediately initiated fire attack. Multiple hoselines were brought inside the units, while additional crews searched for potential victims. A total of twenty-five firefighters worked to extinguish the fire and ensured 16 occupants were safely evacuated. 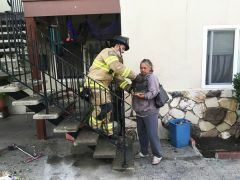 Firefighters also rescued a kitten, returning it to its owner; and recovered an urn with the ashes of loved one, returning them to another resident. Arson investigators responded to the scene; the cause is currently under investigation. Damage is estimated at $100,000. No injuries to civilians or firefighters were reported. Remember that smoke alarms do save lives. Make sure to test yours regularly and replace the batteries when you change your clocks.